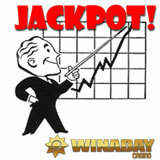 The progressive jackpot that most games at WinADay Casino are tied to is hit so often that it never climbs to million dollar values but lately the jackpot wins have been getting bigger and bigger. Allison P recently won $205,200 playing the unique casino’s popular Chinatown slot game, one of the frequently-won jackpot’s bigger payouts ever. This jackpot winner says she plans to use her winnings to go to the Olympics in Rio next year. She'll also buy her mom a new car. This is the third jackpot payout in a row that’s over $200,000.